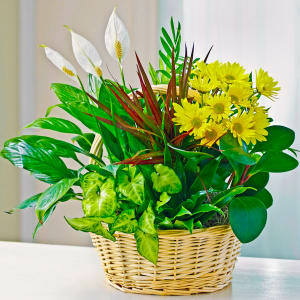 Convey your sympathy at this time of sadness with a classic Dish Garden. • Fresh, beautiful blooms and a lush variety of green foliage plants are specially designed by our floral artists for a lasting tribute. 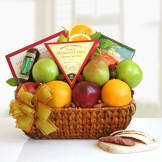 • Appropriate to send to the service or to an immediate family member’s home by family, friends or business associates. 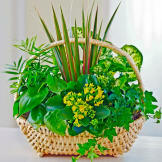 It is very pretty in the photo, and my friend & her family were all pleased with it! I'm assuming that it looks like this photo! If so, it is beautiful! I ordered it from Ohio & as you know, it was being delivered in Arkansas! As I was not physically in attendance at this memorial, I was told that it was absolutely gorgeous and that it looked beautiful. Thank you for handling this order with promptness and with that beautiful basket. It was enjoyed by all. I was more than satisfied...it was BEAUTIFUL..absolutely beautiful, thank you soo much!